Scientists may be one step closer to unraveling the mystery of sunspots — the dark and magnetic blemishes on the surface of our nearest star. These sunspots are thought to occur when increased magnetic activity inhibits the flow of heat onto a patch of the sun, causing it to darken. But the ultimate source of that boost of magnetism has remained unclear. Now researchers say the formation of hydrogen molecules may decrease the pressure on certain areas of the sun's surface, allowing runaway magnetic fields to form and intensify. "We think that molecular hydrogen plays an important role in the formation and evolution of sunspots," said Sarah Jaeggli, a solar scientist who conducted the research while studying at the University of Hawaii at Manoa, in a statement. The sun is mostly made of hydrogen — the element makes up 90 percent of the sun's atoms, while helium contributes about 10 percent, and only 0.13 percent is everything else. Because the sun is so extremely hot (an average of 9944 degrees Fahrenheit, or 5,500 degrees Celsius) this hydrogen is generally in the form of single ionized atoms — that is, only the hydrogen nucleus — floating around in gaseous form. When two atoms combine into one molecule, the pressure it exerts is about half the pressure of the two particles it used to be. And when the pressure decreases like this, the magnetic fields can further intensify. "The formation of a large fraction of molecules may have important effects on the thermodynamic properties of the solar atmosphere and the physics of sunspots," Jaeggli said. During the initial stage of sunspot emergence and cooling, the formation of H2 may trigger a temporary "runaway" magnetic field intensification. The magnetic field prevents the flow of energy from inside the sun to the outside, and the sunspot cools as the energy shines into space. They form hydrogen molecules that take half the volume of the atoms, thus dropping pressure and concentrating the magnetic field, and so on. To test this theory, Jaeggli and her colleagues Haosheng Lin of the University of Hawaii at Manoa and Han Uitenbroek of the National Solar Observatory in Sunspot, N.M., observed the sun with the Dunn Solar Telescope at Sunspot, N.M. While scientists cannot directly observe hydrogen molecules on the sun, they searched for a stand-in, the molecule hydroxyl, which contains one hydrogen atom and one oxygen atom. Because this molecule breaks up at a lower temperature than molecular hydrogen, the team knew that where hydroxyl is found, hydrogen molecules can also exist. "We found evidence that significant quantities of hydrogen molecules form in sunspots that are able to maintain magnetic fields stronger than 2,500 Gauss," Jaeggli said. For comparison, Earth's magnetic field is about one-half Gauss. The researchers plan to compare their observations to computer simulations. 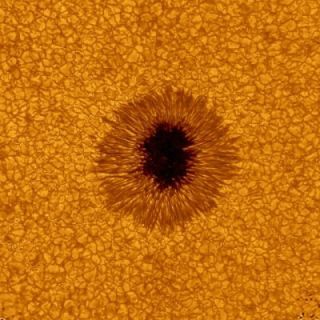 They also hope to gather more observations as the sun ramps up in its 11-year cycle toward a maximum of magnetic activity in 2013, which should provide many more examples of sunspots to behold. Editor's Note: This story was corrected to reflect the fact that hydrogen makes up 90 percent of the sun's atoms, not its mass.